Danish-American mystic and astrologer MAX HEINDEL (1865-1919) is considered by some the greatest Western spiritualist of the 20th century, and with the aid of his wife, research assistant, and fellow occultist AUGUSTA FOSS HEINDEL (1865-1949), he helped develop the modern teachings of the esoteric Christian philosophy of Rosicrucianism. 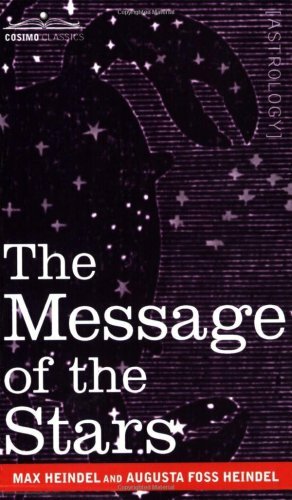 Here, in this 1918 work, the Heindels examine the art of astrology through this lens of this mysterious strain of mysticism that connects humanity to the stars. You'll learn... . why the human body reacts to the vibrations of the planets that we interpret as astrology . how to interpret the complex influence of the planets on each of the signs of the zodiac . how the zodiacal signs affect human health, and which signs rule which parts of the body . how a healer can ensure his vibrations will complement his patient's for maximum therapeutic impact . how horoscopes can diagnose disease . and much more.